The dive site SS Maori or often just The Maori is an inshore historical wreck on a shoreline rocky reef in the Karbonkelberg headland area on the Atlantic seaboard of the Cape Peninsula, near Cape Town in the Western Cape province of South Africa. This is one of the most popular wreck dives of this region, as it is of historical interest, in good condition for it's age, reasonably sheltered and fairly shallow. There is not much to see if you are interested in invertebrates and fish, but there are lots of bits of ship, including some large steam engines, and cargo of railway lines and big cast iron pipes. Close inshore in the middle of the bay between Duiker Point and Oude Schip, but not easily accessible from the shore as there are no roads in this area. This site is in a Marine Protected Area (2004). A permit is required. The site is within the Karbonkelberg restricted zone. The "SS Maori" was a typical British steam cargo vessel of the early 1890’s. owned by the Shaw Savill Company, and commanded by Capt G. Nicole. 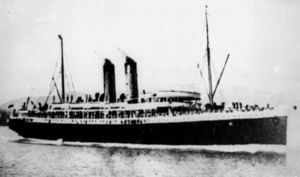 The ship was wrecked in the bay to the north of Duiker Point on the Cape Peninsula on Thursday 5 August 1909 in thick fog and drizzle while on a voyage from London to New Zealand with a crew of 53 and a mixed cargo of British manufactured goods, including explosives, railway-lines, crockery and water-piping. 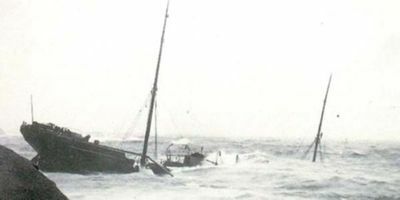 A boat with 15 crew members made for Chapman's Bay, but six were drowned when it capsized in surf. Altogether 32 lives were lost. 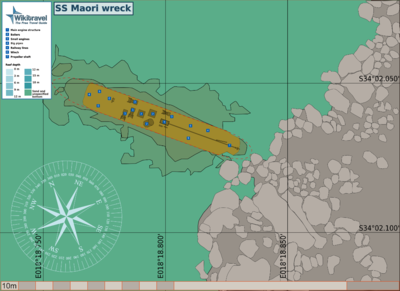 The wreck lies in about 20 m of water a little north of the Oakburn (1906), which sank on the south eastern corner of the bay. The wreck has been extensively worked on in the past for non-ferrous fittings, and a large amount of intact crockery has been recovered over the years. The ship’s bell is in the Hout Bay museum. This is a historical wreck and is now protected by legislation. Removing wreckage or artifacts is a criminal offence. The Maori was a two deck steel screw steamer built in 1883 by Swan Hunter of Newcastle on the Tyne. The triple expansion steam engine was built at Central Marine Engine Works in West Hartlepool. Maximum depth at the wreckage is 21 meters on the reef near the bow. Average depth during a dive is about 13m, and the top of the engine is about 6m deep. Visibility is variable, and depends to a large extent on the weather of the previous few days. Strong swells with a westerly component, particularly from the north west, will tend to churn up the water and reduce visibility considerably, while a strong south easterly wind will tend to drive the surface water offshore, and the upwelling of water that replaces it is usually clearer, at least at first, but often the upwelling is closely followed by a plankton bloom, which will reduce visibility near the surface. Visibility at the Maori can differ from nearby sites, but tends on average to be similar. The inshore end of the wreckage is at S34°02.072’ E018°18.828’, and the offshore end of the main hull remnant is at S34°02.051’ E018°18.761’. The hull centreline axis is approximately 314° magnetic, length 112m, width of main section about 18m. 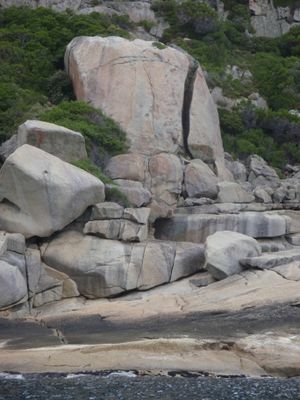 The surrounding area is scattered high granite corestone boulders, particularly inshore, with low boulders and lots of wreckage extending beyond the sides of the hull remnant. There are three large Scotch boilers and the triple expansion steam engine structure near the shore, and further out near the end of the main wreckage are a number of large pipes (about 1.2 metre diameter) and railway lines still stacked in place. Scattered to the sides are more rails and pieces of hull debris. There are bits of porcelain and bottles still visible in places. The boilers are about 4m long and 4m diameter, and the fireboxes are closed and the covers heavily encrusted, so it is not apparent how many there are to each boiler. There are two boilers about 4m forward of the engine. On the starboard side the boiler is in place about 3m from the hull side, and to port it has broken loose and rotated 45 degrees on both vertical and transverse axes, so tht it is almost at the hull side, and tilted with the aft end facing inboard and upward. the shell of this boiler is damaged and parts are missing, so that the fire tubes and a firebox can be seen inside from the port side. The third boiler is on the centreline a short distance forward of the other two, and appears to still be firmly attached in its original position. The central section of the hull bridges across some large boulders, and there is a space under this section of the hull that averages about a metre high, and extends right across the hull, with a bilge keel at each side, and the keel of the vessel clearly identifiable between. There are a few holes un the bottom plating in this part of the wreck which though too small to swim through, admit light into the space under the hull, and are large enough to stick your head into to look at the bottom structure. Forward of the boilers and aft of the cargo pipes there are several items of large machinery, which have the look of horizontal two cylinder steam engines. There are crankshafts with flywheels and connecting rods. The flywheels are about 2m diameter in cast iron with multiple spokes and a rim about 200mm thick. Each engine has two flywheels at opposite ends of the crankshaft. There are two of these engines to port lying athwartships. The forward engine is close to the hull side and the after one is about 3m away from the side. On the starboard side is another similar engine lying lengthwise parallel to the starboard side, and a fourth slightly smaller engine is on the starboard side of the main engine, between it and the hull side. The structure of the main engine is still basically intact, and the cylinders can be seen with piston rods, connecting rods and structural pillars between the cylinders and the foundation. Other rods may be valve rods, but everything is heavily encrusted and no detail is visible. There appears to be a condenser on the port side of the engine, and may be a feed water pump on the port side a bit further outboard. There is also a lot of totally unrecognisable machinery and equipment in this area. The propeller shaft extends from the main engine crankshaft aft along the centreline and ends at the stern gland and a small amount of the sternpost at a depth of about 7m, quite close to the shoreline rocks. The propeller is gone. The cargo of railway lines is partly neatly stacked on the starboard side of the propeller shaft, and partly forward of the steam engines of the cargo, and above much of the cargo of large pipes. There are also large numbers of rails scattered like twigs on the reed to the sides of the hull. The cargo pipes are mostly forward of the engines, and below the railway lines. They extend the full width of the forward part of the hull and are stacked at least two deep. They appear to be cast iron, with a diameter of about 1.2m and length of about 3m each, but stacked so that they are in line with about 4 in a row, and this is about the length of the railway lines. There are a few pipe sections on top of the rails and forward of them, and a few aft of the main engine on the starboard side. The pipes and rails appear to have originally all been stowed lengthwise and parallel to the centreline, as this is how most of them still lie. Geology: Granite corestone reefs of the late Pre-Cambrian Peninsula pluton. The site is often at its best during or after a south easterly wind. The wreck is in a bay that is well protected from the south easter, but the trip back is directly into this wind, which tends to make for a cold, wet and bumpy ride. The bay is partially protected from south west swell, but some of it will get around duiker point and will cause surge on the wreck. Choose a day when the south west swell is low. The site is usually at it's best in spring and summer but there are also occasional opportunities in autumn and early winter. The site is very much more pleasant if the visibility is good, but can be worth a dive even in poorer visibility as long as the surge is not too strong. This is an area which sometimes has upwellings, caused by the south east wind, resulting in cold clear water for a while, but which may develop a plankton bloom over a few days which will reduce the visibility again. View of the split rock from above the main engine. The site can only be accessed by boat. It is about 7.75km from Hout Bay harbour. It is not far from the shore, and a shore entry or exit is quite feasible, but there are no roads leading to the area. The nearest parking is a few kilometers away over bush paths at best. Not a particularly colourful site, as the wreck seems to be largely covered by seaweed. Lots of kelp along the edges and high areas, encrusting corallines on the deeper detritus, and lots of small browns and reds all over the plating and frames. Also mucky brownish fuzzy stuff, which may be hydroids or something like that. This site is dived to look at the wreck, not the marine life. Large numbers of box jellyfish are common on the lighter sandy bottom around the wreck. The engine structure, complete with cylinders and piston rods, a condenser, three boilers, the propeller shaft and other machinery, including what may be a donkey engine, are recognisable, and some of the cargo, such as the large pipes, several horizontal steam engines, and a large quantity of railway lines is still in place. The anchor winch is slightly away from the main wreckage, forward and to port of the hull. Wide angle lenses are appropriate as there is mainly wreckage to photograph, and the light quality and visibility are usually unpredictable. Anchor off the split rock about 40m off shore, looking directly into the split. (GPS position given above). The parts of the wreck to seaward of this area are more interesting and in better condition than the part towards the shore. Cold water. Strong surge. Ragged wreckage. Entrapment in small spaces. No special skills required. The site has been used for night dives, as it is not easy to get lost, and in an emergency it is usually possible to climb ashore. A dry suit or 7mm wetsuit is recommended as the water is usually cold. A light is useful for looking into dark places in the wreckage. Those who are well insulated or resistant to the cold may find Nitrox useful to extend no-decompression times. This page was last edited on 5 December 2011, at 12:22.